Doesn't seem like it happens to many people....more of an annoyance than anything but I guess I can live with it if there is no solution. Maybe there's no solution to this problem/annoyance but when I accidently posted twice and wanted to delete the duplicate post, there was no option to do so. I adjust the brightness either by right clicking on the battery icon in the panel and sliding it left or right or fn key with F5 or F6 (on my computer). HI all, I am using Xfce Power Manager with Peppermint 9 and each time I put my computer into suspend I have the display brightness set 'just right'. After I come out of suspend, the display brightness is always up full blast. Is there a way to have it remember what I had it set to or is this just the way it is? where a fellow was having a similar problem and the fix didn't work for me (perhaps because he was interested in having the brightness stick after a reboot or shutdown not suspend). is DATA on an internal drive ? BE AWARE, if DATA is on an external drive the above commands could take some considerable time (depending on the amount of files/folders). and remember, the above commands wil only work on files/folders you own. ALSO bear in mind that going to mark ALL files as non-executable .. even scripts and binaries (not just text files). HOORAY! This worked like a charm. Thank you very much PCNetSpec! BTW..... All the info on the DATA partition on my HD I owned and there were no scripts or binaries to worry about either. Thank you everyone else for you participation too! drwxr-xr-x  4 root  root  4096 Jul 11  2018 .
drwxr-xr-x 24 root  root  4096 Mar  5 10:58 ..
EDIT: Command corrected and... tested on NetBSD. Sorry, but it's the machine that I have with me at the moment. Read through this post which does seem very similar. Doesn't seem there was a solution though that could be applied here other than just grin and bear it until I eventually find them all and manually uncheck the boxes. 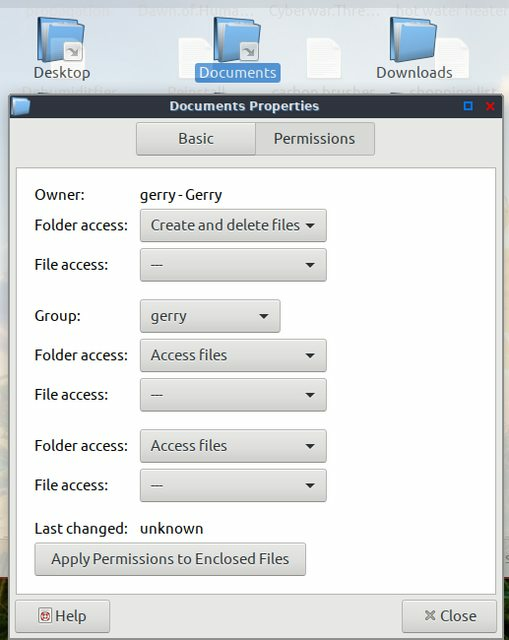 That's not a default .. where is the text file ? These text files are everywhere....mostly in my personal documents folders though: /mnt/DATA/Desktop,Documents, Music etc. That's probably the issue .. as these are on a drive/partition you're mounting via fstab, your fstab entry needs fixing, and or the permissions of the mountpoint need fixing. Here is the output of my fstab.... anything I can change here to make my DATA partition (that contains the text files in question) to not make them executable? As far as why it's set that way by default, I have no idea. I've never had that happen and I've created a new text document as recently as Thursday. In what format did you save it? No problems with checking or unchecking the box, its having to do it with every text file I have that's the pain. I think it all started after I reinstalled Peppermint one time. Once they are unchecked, they stay unchecked the next time I open them. These files were never originally created with this box checked but somehow all got checked at the same time. Thank you for the link, but what it said was Chinese to me.... I would need that dumbed down a bit in order to understand or do anything with it. 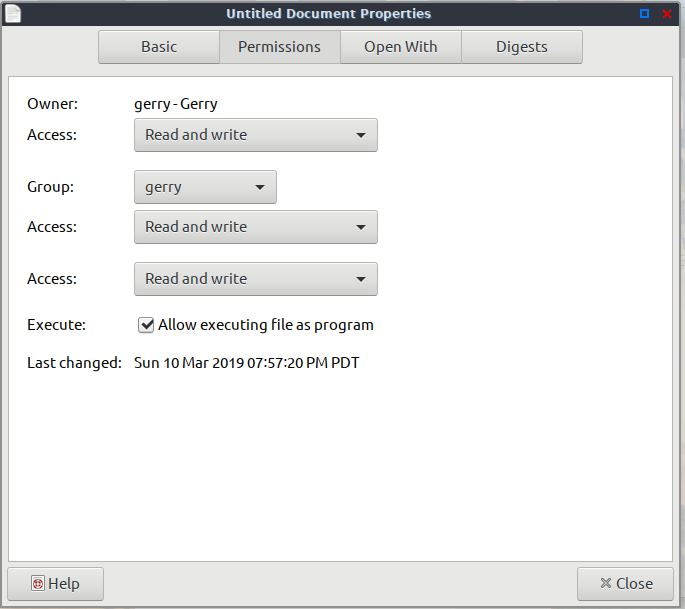 I then have to right click on the file/ properties / permissions / then uncheck the box "allow to executing file as program"
Why is this checked as a default setting and how do I permanently keep this from happening? Any help is appreciated! Thank you for your reply PCNetSpec. None of the fixes apply to me and I'm limited with my bandwidth so I'll go ahead with the .iso I already have. Hello! I've just downloaded the latest version of "Peppermint-9-20181222-amd64" and am ready to do a fresh install. I've been running the previous version of Peppermint 9 now with no problems and have all my files in a DATA partition..... thanks to the wonderful help I received from here. Before I continue with following the symlinks tutorial, I was just wondering if there is anything updated or special I might need to do before I continue? No problem moving the folder but having trouble with the symlink. The symlink file made in my home folder is "broken" as it doesn't exist. Not sure if I should start another thread but it has to do with symlinks. I just installed Oracle VM Virtualbox and created a Windows 7 VM with the help of PCNetSpec. What I didn't realize at the time was that it was installed to my Home partition which is only 18 GB and as I copied some large files to the desktop it gave me an error saying that it was full. Seeing as how I have my files all saved in a separate DATA partition (776 GB remaining) , can I also do this (symlink) the Virtualbox VMs folder that contains the Windows 7 OS .vbox and .vmdk files to the DATA partition as well? I am not willing to give that much of my life to a pet peeve that I can live with. I'll mark the post as solved...thanks for the reminder.